The Toyota Curren wis a Japanese automobile biggit bi the Toyota Motor Corporation. It wis based on the Toyota T200 chasis. 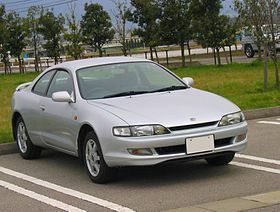 It shared the same interior an rear end design as the 1994-1998 Toyota Celica coupé. Instead o haein fower roond heidlichts lik the Celica, it haed a fixed heidlicht design resemblin that o the 1992-1996 Toyota Scepter. 1995 saw the introduction o the XS an ZS S-Packages which includit a rear spoiler, rear wiper, alloy wheels, an 10 hp mair on the ZS models. A new model, the ST208, wis introduced as a base model tae the lineup. It haed twa trim levels the TS an the TS Private Selection which includit a rear wiper an a rear spoiler. Baith trim levels wur pouered bi the 1.8L 125 hp 4S-FE ingine. In 1996 the Toyota Curren received a facelift that includit a redesigned front bumper, clear front turn signals, an a redesigned front grille. In addition, it an aa received redesigned tail lichts that featurt a daurker tint an clear turn signals. 1997 merked the last year o the fower wheel steerin ST207 model. The rest o the models remained unchanged till it wis discontinued frae production in 1998. Wikimedia Commons haes media relatit tae Toyota Curren. This page wis last eeditit on 21 August 2018, at 14:03.